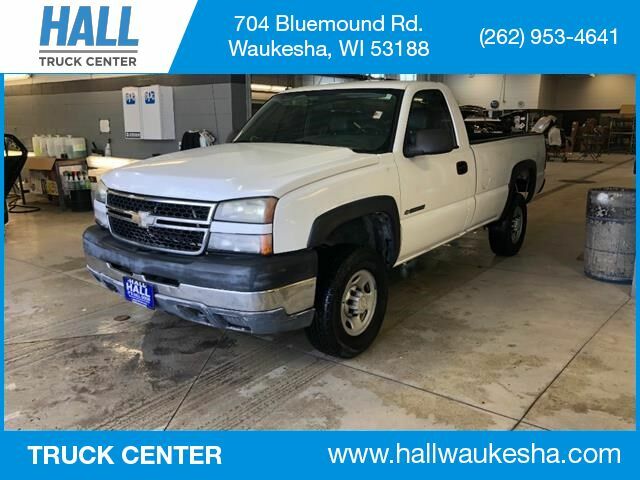 A WHITE 2007 CHEVROLET SILVERADO 2500HD CLASSIC 2WD REG CAB 133 WORK TRUCK WITH 124,818 MILES! GRAY INTERIOR, A TRUE ONE OWNER VEHICLE, PRIMARILY DRIVEN IN SUNNY FLORIDA - NOT IN THE WISCONSIN SLUSH AND SALT! EQUIPPED WITH BED LINER, VINYL SEATING, 40/20/40 BENCH SEAT WITH DROP DOWN CONSOLE, WORK TRUCK PACKAGE: CRANK WINDOWS AND RUBBER FLOORS, LIGHTLY TINTED WINDOWS, AM/FM RADIO, V8 ENGINE AND MORE!